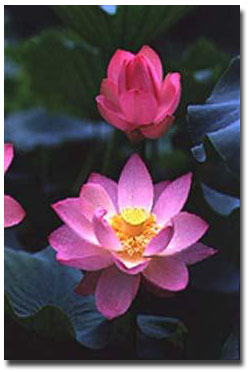 The Lotus has always had an important place in both Hinduism and Buddhism. Lakshmy, the goddess of wealth and prosperity is depicted as standing inside a huge lotus and Lord Vishnu has lotus in one of his four hands. The Lotus is an important symbol in Buddhist images.It is thus easy to understand why it was chosen as the National Flower of India. In traditional Indian medicine (Ayurveda), the roots and stem of the lotus (and water lilies, a close relative of lotus) have been used. As adornment on women’s hair and as decoration in rooms, lotus is often used in India. The many varieties of color, size, shape and numbers of petals are coveted by those who use this flower for these purposes.